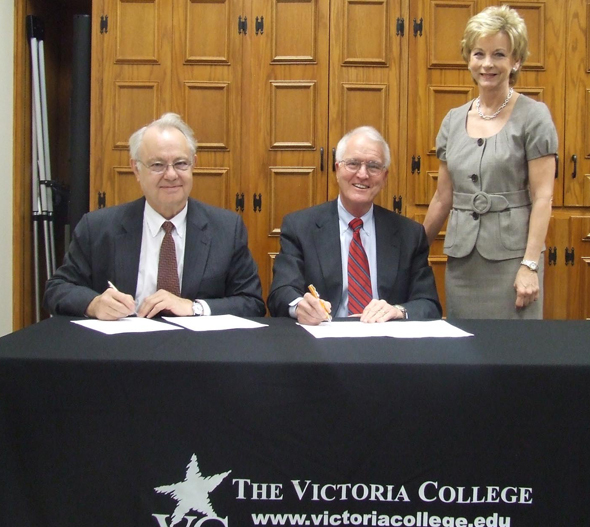 David Payne, left, Sam Houston State University provost, signs an articulation agreement with Victoria College, which provides a number of benefits to Victoria College students in completing associate and additional degrees. Also signing was Jimmy Goodson, president of Victoria College. Texas State Rep. Geanie W. Morrison, a Victoria College graduate who now chairs the Texas House of Representatives Higher Education committee, attended the ceremony. David Burris, articulation coordinator, said that SHSU now has similar agreements with 16 community colleges.